There's nothing better than celebrity endorsement for adding glamour to a holiday. And I'm talking about a real endorsement, like Kate Moss being papped on the beach in Formentera, or George Clooney snapped zooming around Portofino on a motorbike -- not paid-for and staged appearances. Love them or hate them, when celebrities give a holiday their seal of approval, it becomes instantly desirable to the public. But what about cruising? Would we ever see the Beckhams on Oasis of the Seas or Cheryl Cole sunning herself on Azura? Unlikely for most mega-ship cruise lines. For the big A-listers, even in the absence of paparazzi at sea, passengers armed with iPhones and cameras are just too much of a risk for most. No big name wants to be snapped showing a bit of cellulite around the pool. Where you might spot a star, however, would be on ultra-luxe ships or even larger vessels with exclusive, ship-within-a-ship boutique set-ups (such as Cunard and Norwegian Cruise Line). "Celebrities are attracted to Cunard, and Queen Mary 2 in particular, because some of them would rather travel by sea than air," explained Michael Gallagher, spokesman for the line in the UK. "If their schedule permits them to travel to Europe or the States for the latest premiere or concert, then they will opt for Queen Mary 2. The Grills system also helps as they can enjoy all the facilities -- penthouse, restaurant and bar -- without really having to spend time in the rest of the ship should they choose not to." These days, Cunard really is the only line to have consistently maintained a status as ocean-going transport of choice for world-famous stars, and then only on its transatlantic crossings. 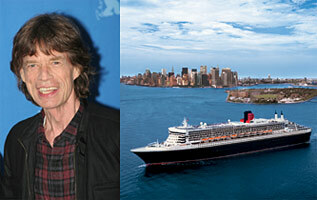 David Bowie, Mick Jagger, George Harrison, Dame Julie Andrews, Sharon Stone, Meryl Streep and Twiggy have all sailed. In the glory days of transatlantic travel, before flying became fashionable, the top suites on the great ocean liners were a kind of exclusive club for the rich and famous, who would often party on down for the whole crossing, meeting up with famous friends in the dining room and vying for invitations to the captain's table. Debbie Reynolds, Ginger Rogers, Gregory Peck, David Niven and Rita Hayworth were all regulars on Cunard's liners. Celebrities had to work harder for their fame in those days, before the era of Hello magazine, social media and digital photography, and many would use the arrival in port as a way to court the paparazzi of the day. The arrival of transatlantic jets with their cosy first-class cabins soon put a stop to all that as celebrities switched to the skies. Celebrities do still go on cruises other than Cunard transatlantics, of course, but usually as some kind of commercial transaction. First, there are the godmothers, who are willing to gush about the beautiful ship they are naming, but are unlikely to ever actually holiday on it. As far as we know, Sophia Loren isn't a regular on MSC Cruises' ships, even though she's named eight of them. Silversea Cruises' relationship with its glamorous ambassador, Isabella Rossellini, finally came to a quiet end, even though she had a suite named after her on each ship during her association with the line. Next are the famous chefs like Marco Pierre White or Gary Rhodes, or TV personalities like Olly Smith, P&O Cruises' wine expert. This doesn't really count as celebrity spotting, as they're paid to be onboard, but some are happy to admit that it's nice work if you can get it. Jacques Pepin, Oceania Cruises' celebrity chef, enjoys cruising so much he's been known to hop onboard -- well, just because. Then there are the guest speakers, most of whom fall into a category of celebrity that includes being a household name -- but not quite fodder for Hello or Heat magazine. The relationship these big names have with cruising is interesting. In case you're worried that your hard-earned cruise fare is lining the pockets of a celebrity speaker, take heart in the knowledge that most of them do the job for no fee. "It varies from company to company, but it is prudent to say most of them don't get paid," explains Peter Rushton, owner of the Brighton-based P&R Agency, which places 1,000 speakers a year on 45 ships. "But they do get a very nice cabin, they are well treated and they get a cruise for nothing, with their partner." The workload isn't exactly strenuous; Lord Ashdown, for example, gave only one after-dinner talk on Queen Victoria in the Baltic, followed by one question and answer session, in return for a week's cruise. And so it is that politicians, soap actors and newsreaders have joined the ranks of regular cruisers. "Some do two or three cruises a year," says Rushton. Are they pestered by the other passengers? "Quite the reverse. They love to socialise and participate. I've only had one in 12 years who was reluctant to interact with the other guests. They get given a balcony or a top-grade cabin in any case, so they have some privacy." Rushton's speaker list includes Radio Four "Today" presenter John Humphrys, newsreader Fiona Armstrong, Sir Bernard Ingham (former chief press secretary to Margaret Thatcher), explorer John Blashford-Snell, Edwina Currie and Coronation Street's Bill Roach, all of whom have been placed on lines such as Oceania, Fred. Olsen, Cunard, Voyages of Discovery, Saga Holidays, Spirit of Adventure and P&O Cruises. P&O, in fact, has worked to up its celebrity speaker content, with an impressive line-up of stars from screen and sport including commentator Tony Gubba, boxer Sir Henry Cooper, ice dance champion Nicky Slater and former Liverpool striker David Fairclough. A speaking gig isn't always an easy ride for a celeb; one famous actress who had a book to promote told us that she'd been insulted by the cruise director, told she had to mingle with guests at dinner instead of sitting quietly with her partner and had her luggage searched when she left the ship in case she'd stolen anything! What about the really famous who actually choose to go on a cruise as a personal holiday, and pay for it? The reality is that sightings are rare. Oprah famously chartered NCL's Norwegian Gem in 2009 in the Mediterranean for her 1,700 employees and their families. The party enjoyed a 10-day cruise, with Oprah presiding over events from one of the ship's magnificent Garden Villa suites. The late Sir John Mills, veteran of 120 movies, was a big fan of Star Clippers Cruises, even when he was wheelchair-bound. Cracker and Harry Potter star Robbie Coltrane has been spotted on the Queen Mary 2. Oasis frontman Liam Gallagher crossed the pond on Silversea's Silver Spirit when he and his family were stranded in the USA by the ash cloud. But few of us "ordinary" cruisers could claim to have hobnobbed with true megastars by the lunch buffet. What is changing is the endorsement of cruising by a younger crowd of personalities from the worlds of TV and music, partly thanks to canny marketing by one cruise line. Princess Cruises has made a name for itself in the world of celebrity, about which it is refreshingly upfront. The cruise line offers free cruises to famous names in return for write-ups in national newspapers, who like nothing more than a celebrity byline to grace their travel pages. Everybody wins: The celeb gets a free cruise (and quite a few, apparently, have become hooked); the newspaper gets a big name writer; and the cruise line gets celebrity endorsement. Kimberly Walsh from Girls Aloud sailed on Crown Princess in the Caribbean with her mum, partner, sister and brother (and the entourage paid their own way, incidentally), while Duncan James from Blue took his mother and partner around the Mediterranean on Ruby Princess. "Strictly Come Dancing" judge Alesha Dixon did the Mexican Riviera, while Loose Women's Claire Sweeney, who worked for four years as a singer on P&O Cruises at the start of her career, sailed with Princess to Tahiti. Another "Strictly" star, Jill Halfpenny, took her husband, baby and parents on Caribbean Princess. "We do it for marketing purposes and word does get around," a spokeswoman for Princess told Cruise Critic. "Princess has a bit of a name for working with celebrities. We look after them well." So there you have it. If aging politicians and serious newsreaders are too dull for your holiday snaps, it looks as though a cruise with Princess or a transatlantic on Queen Mary 2 is your best option for schmoozing with the stars. You'll have to fork out for Grill class, though.